The Houston Police Department released a list of top ten vehicles reported stolen during the month of August 2018. If your model is below, be sure to take extra safeguards such as purchasing auto theft insurance, having a security system, and parking in well-lit areas. Reports on stolen vehicles are not uncommon. We often hear on the news that the stolen vehicle was part of a police chase or involved in a car accident. It probably leaves you wondering who is at fault. If your car has been stolen, immediately file a police report and an insurance claim. Furthermore, if your car was stolen and involved in a car accident, you are not liable for any damages or injuries. If you have been hit by the driver of a stolen vehicle, the driver of the stolen vehicle who hit you is responsible for the property damage and your injury. 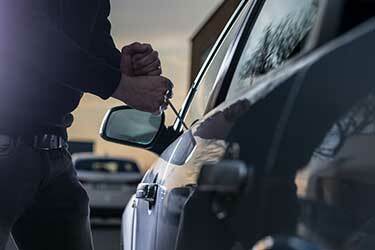 It is unlikely that a car thief will pay for your damages. The conflict in car accidents involving stolen vehicles is deciding which insurance company among the owner of the stolen car, the thief, or your personal insurance will be responsible for the damages. A car accident attorney can help you better understand your options. Every Texas driver is required to purchase auto liability insurance and must show proof of coverage in the event of a car accident. Liability insurance helps pay for another person’s damages or injuries in an accident if you were at fault. The minimum coverage required by state law for every Texas motorist is up to $30,000 per injured person, $60,000 for all injured persons in the same accident, and $25,000 for property damage per accident. Other optional types of coverage include Uninsured/Underinsured Motorist (UM/UIM), it pays for your expenses resulting from an accident with the uninsured or underinsured driver, or damages from a hit and runs. Personal Injury Protection (PIP) covers medical payments including lost income and caregiver costs from the accident. UM/UIM and PIP coverage is optional, and many people choose to opt out in order to lower their premium. Minimum coverage will not pay for your expenses if you are injured or hit by an uninsured or underinsured motorist. Many car accident victims are left in a financial bind when they need help the most. If you or a loved one have been in a car accident with an uninsured or underinsured driver, it is important to contact a legal expert to evaluate your options. Call (713) 987-7111 or send us an email to discuss your car accident injury case.